The video above will appear in the slide show below. If it does not, then please watch it AFTER the slide show below. Have you seen some of your amazing volunteers get burnt out, or suffer compassion fatigue? There is a confidential helpline that’s available to all animal activists, shelter workers, and anyone else who’s helping animals. Whenever someone calls or emails the helpline, they get a compassionate response from a fellow advocate who is trained in nonviolent communication. Now there’s a convenient way to be listened to, and given great emotional support from an outside person who really “gets it,” and without having to pay any money. The number to call is 1-800-705-0425. The email is helpline@idausa.org. As both a volunteer counselor and a caller who uses the helpline, I want more activists to know of this wonderful freebie that’s available to them! Seek out a therapist or a support group for further help. Cyber Security and Future Crimes are a real threat, but with a few simple steps you can eliminate 85% of the threats to your money, your things and your life. Enjoyed this course very much. It was very interesting to learn what it takes to be a volunteer at BCR. I had a lot of respect for them before, now I have even more. I wish the sound quality of some of the videos could have been better, or helped with closed captioning, but this is a minor complaint. Thank you for offering this very educational and fun course! I learned so much from this course! I especially enjoyed Manager level 5, but all was very informative. Thank you for the time it took to create this course! I will be recommending to others. I wish I lived nearby and could use this information at the sanctuary to become a partner/keeper, but until that is possible, I will use what I learned to educate others online when the opportunity arises. I had a lot of fun and had a lot to learn. I enjoyed learning about the these animals and I wish more people could see the beauty of these animals or all animals at that manner. But, thank you for sharing these interesting tips and information. I encourage anyone seeking to enter a field to take this course for the experience and knowledge it gives. Thank you! I learned so very much from this course. 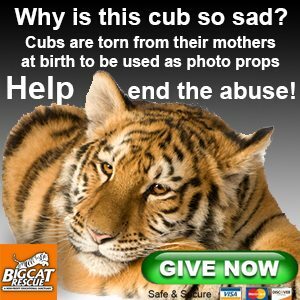 I certainly agree with Deb Quimby when she said that she wishes she lived near Big Cat Rescue to put her skills learned to greater use at the sanctuary! I enjoyed taking Zoo College and have greater appreciation to the work Big Cat Rescue does having gone through this!